Rent Hilton Alexandria Mark Center | Corporate Events | Wedding Locations, Event Spaces and Party Venues. 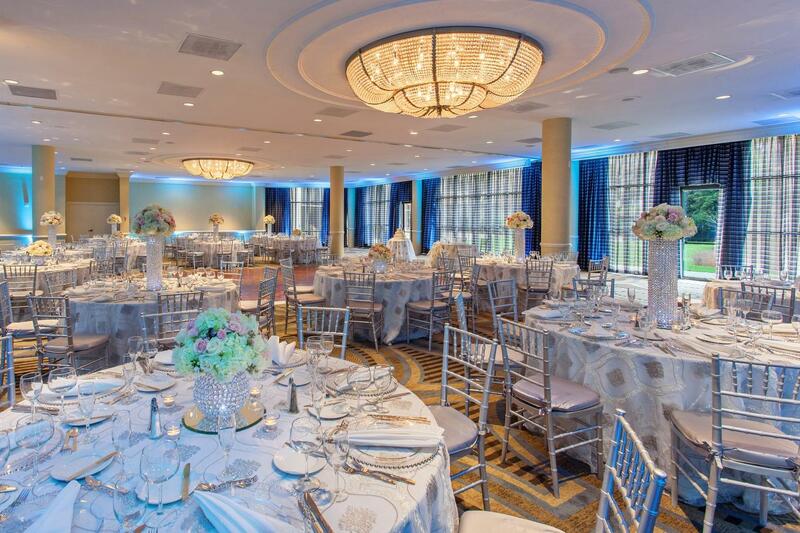 Perched on 43 acres of pristine nature preserve and a sparkling lake, this hotel in the West End of Historic Alexandria, VA is the ideal event venue in the DC metropolitan area. Take small meetings and intimate business gatherings to the next level at the Hilton Alexandria Mark Center hotel. A dedicated meeting planner will oversee every detail, from catering options to room configuration, to ensure each meeting is a success. The executive center offers ergonomic chairs, facility-wide WiFi and contemporary A/V technology. Conduct a virtual conference call with global staff or present the next big idea to company executives. At the end of a long day, relax over dinner at Finn & Porter, or treat colleagues to a nightcap at the Lobby Lounge. Gatherings come to life against the backdrop of the Washington, DC skyline. This leading conference hotel boasts impressive amenities, including facility-wide WiFi and cutting edge A/V equipment. Present a keynote address to 1,000 in the stunning Plaza Ballroom then lead breakout sessions in productive meeting spaces throughout the hotel. Planners can organize a variety of social events in the nearby neighborhoods and historic areas of Alexandria, or arrange a night out at DC hotspots. Use the complimentary shuttle service to visit the fashionable urban village, Pentagon City and shop in the upscale Pentagon City Mall. Tie the knot in style at the Hilton Alexandria Mark Center hotel. This beautiful Alexandria wedding venue offers brides-to-be 55,000 sq. ft. of flexible space for staging ceremonies and receptions. Exchange vows in an intimate outdoor ceremony, or stage a grand affair in the spacious and elegant Plaza Ballroom. Arrange private dining at Finn & Porter for a rehearsal dinner or pamper members of the bridal party with room service for a wedding day brunch. Experienced onsite wedding consultants can offer guidance through every step of the planning process, while the tenured culinary team provides flawless presentation and prompt delivery of food and beverage service.